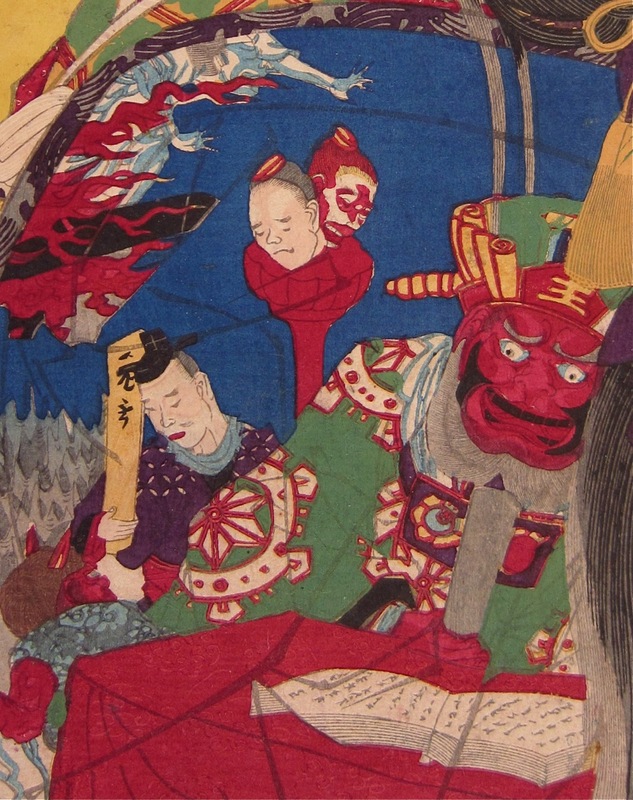 Toyohara Kunichika (1835-1900) Thirty-six Good and Evil Beauties: Jigoku Dayu (Hell Courtesan), 1876. Oban. The series Thirty-six Good and Evil Beauties is by far Kunichika’s best. Groundbreaking in so many ways, one gets the feeling that the artist here is being dragged along by events - unable to resist the pull of history. The quality of the printing is outstanding, the drawing is fluid and original and the designs bristle with invention and startling use of colour and pattern. Each print from the series takes a famous woman of history and portrays her beneath a cartouche explaining her story. Some of these characters are warlike, some evil and vain and some are pious or devoted. What is interesting historically is how Kunichika presents women as individuals and not archetypes. This is at variance with the traditional bijin portraits of pliable or available females and chimes with Yoshitoshi’s later series on similar themes such as Thirty-two Aspects of Customs and Manners from 1888. 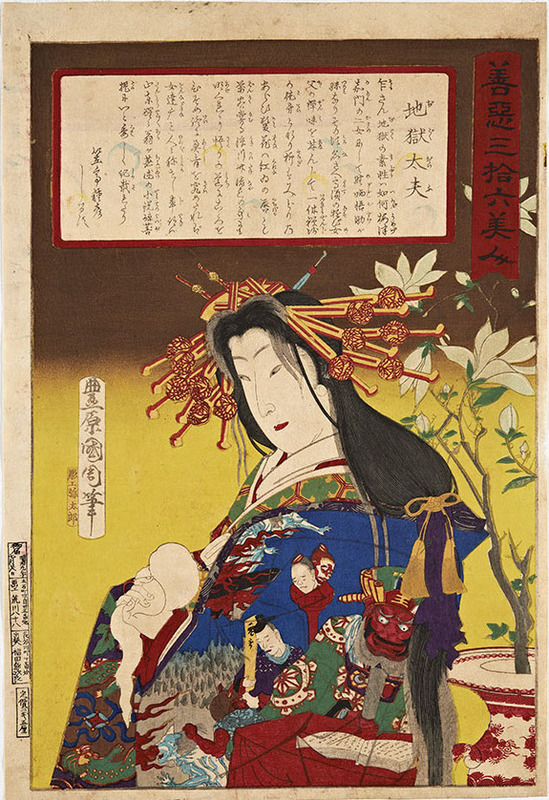 In this piece, Kunichika represents Jigoku Dayu, the so-called hell courtesan, usually depicted wearing a coat of all the souls she has condemned and a portrait of Ema-O, the king of hell. Once upon a time, a very beautiful and elegant courtesan lived in the pleasure quarters of old Japan. She was the daughter of a samurai, who was kidnapped by his enemies and was sold to a brothel. She renamed herself as “Jigoku” (hell) because she believed that her misfortune was the result of karma from her previous life. She served as a courtesan to Zen monk Jyyku and studied Buddhism to free herself from her tragic destiny. When she suddenly became ill and died, Enma-O, the King Of Hell, stood her before his magical mirror, which shows the true souls of the deceased, and she finally understood how black was her heart. To punish her, the King of Hell made her wear an uchikake, an outer-kimono, made of all the souls of hell being tortured by demons, the weight of which was a constant reminder to the courtesan of how badly she had treated others. A fine print from Kunichika’s finest series. These prints are very rare and very hard to come by… slipping between the gaps of the valuable and the unconsidered. This piece is remarkably full sized and with intact marginalia (which give details of Kunichika’s address!) Colour, impression and condition are all fine.